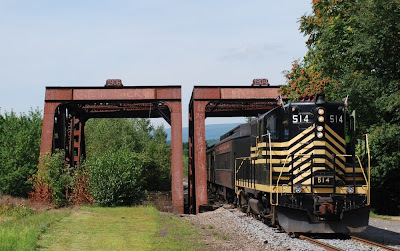 NKP 514 leads a four car consist of coaches over the Lackawanna River in Olyphant (PA) on August 17th after departing from Steamtown earlier on the morning of August 17th. The D&H built these identical trestles in 1904 and 1906 to carry four tracks through this area on what was known as the Penn Division. Called the Heritage Explorer Train, this sold-out excursion was sponsored by Lackawanna Heritage Valley National and State Heritage Area, its destination was Carbondale’s (PA) annual Ethnic Heritage Festival. As to the significance of this location, Olyphant was where my father lived as a child and my godmother resided until her passing. Every time we drive over this grade crossing, I would look out the window and hope to see a train. Alas, that vision never happened until August 17th when I photographed this excursion. With that being accomplished, that item can be crossed off my "bucket list". 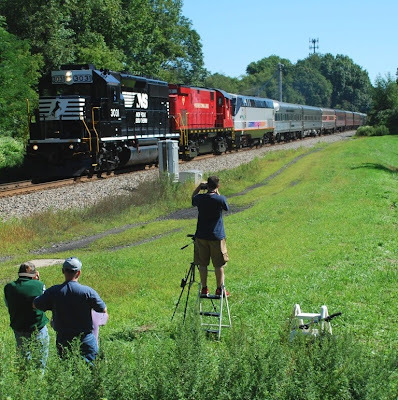 The wait is over for this group of photographers that waited patiently trackside for the Lehigh Limited’s passage at Bloomsbury (NJ). NS 3031 leads M&E 18 and NJT 4802 along with sixteen coaches past the Agway Building on August 24. People driving along Staats Road would sometimes stop to inquire what everyone was waiting for. That response was "...its a specail excursion train called the Lehigh Limited..." followed by a brief explanation of what this train was and its significance. The train’s passage through Bloomsbury definitely generated lots of interest for both railfans and non-railfans alike. Later in the day, its return route was via the Washington Secondary with M&E Alco leading the way here as it passed bythe Port Murray depot. fellow, Hanyan Wu from the Mason School of Business at the College of William & Mary, focused on solar energy opportunities and high-efficiency lighting projects across the company's network. Hanyan also helped spearhead a project that is on track to bring the city of Jacksonville some of its first electric vehicle charging stations. "CSX never stops searching for new ways to increase energy savings and implement more efficient technologies," said Carl Gerhardstein, assistant vice president, health, environment and sustainability, CSX. "Year after year, our EDF fellows bring an invaluable outside perspective that helps keep CSX focused on sustainable, economical investments in our facilities and infrastructure." This year, Hanyan focused on the feasibility of solar photovoltaic technology at three locations across the CSX network, as well as optimal locations for future efficiency improvements and renewable energy projects. With the help of the CSX Public Safety, Health and Environment Department, he also explored the possibility of bringing the first electric vehicle charging stations to downtown Jacksonville in the coming months. The proposed energy initiatives together would result in approximate savings of $240,000; 1,572 metric tons of carbon dioxide (the equivalent of 328 passenger vehicles); and 2 million kilowatt hours annually (enough to power 211 homes). "We are proud to have found such a loyal partner in CSX," said Victoria Mills, managing director of EDF. "The company's commitment to the EDF Climate Corps program reflects its dedication to environmental stewardship, and opens up exciting opportunities for both CSX and the student fellows who work there." Environmental Defense Fund is a leading national nonprofit organization representing more than 700,000 members. Since 1967, EDF has linked science, economics and law to create innovative, equitable and cost-effective solutions to society's most urgent environmental problems. JACKSONVILLE, Fla. - Aug.16, 2013 - CSX Corporation recently presented its Industrial Development Partnershipping Award to Jerry Hayes, Executive Director of the Defiance County (Ohio) Economic Development Office. The award is in recognition of Hayes' impact on local economic development and specifically the effort to bring the Consolidated Grain & Barge's new $20 million grain elevator to the region. CSX's Partnershipping Award is presented to individuals whose efforts have been instrumental in the creation of a new industrial development project on CSX and who exhibit high levels of collaboration and professionalism. Clark Robertson, CSX's assistant vice president-regional development, said Hayes' "dedication, expertise and persistence were instrumental to the success of the Consolidated Grain & Barge development. He played a key role in the site search, as well as securing road improvements and other state and local incentives needed to green light this project." "Jerry and the rest of the Defiance County Economic Development team are well deserving of this award and have more broadly helped to make Defiance an outstanding place to do business," Robertson said. said Clark Robertson, assistant vice president, regional development, CSX. The Big Little Railroad Shop is having a TAX FREE SALE from August 24th to September 15th (inclusive). We will pay the New Jersey Sales Tax on purchases during that period (except for brass models). Received the following comment via email with link to article below. Following article is from The Star -Ledger dated 8-12-13. Did you hear the one about the train that slid sideways into the ticket booth, leaving investigators wondering how to clean up a wreck that left 17 cars of coal perpendicular to the track? Or the one about the wooden train station office that was so hot, employees ended up practically working in their underwear? How about the tale of the skittish tower operator who jumped out of the tower every time a train approached, out of fear it would strike him? Lend Frank “Bookie” Bookstaver an ear, and the stories will flow. Bookstaver, whose days of working on trains date to the World War II era, is filled with more than six decades of track tales. After 64 years of working on the railroad, Bookstaver, 85, America’s oldest train dispatcher, is retiring and taking his stories with him. A legend among NJ Transit employees, Bookstaver had planned to work at least another year and a half. After all, his dad, also a railroader, worked until 91. But treatment for prostate cancer has left his right leg numb, making it increasingly difficult to get around the rail operations center in Kearny. The employee closest in age to Bookstaver at the center is 24 years younger than him. He will be honored Wednesday during NJ Transit’s monthly board meeting, at 9 a.m. at the agency’s headquarters next to Newark Penn Station. Sincaglia said NJ Transit will never again see the likes of Bookstaver, who started his career on the Erie Railroad and ended it after 30 years with NJ Transit. Sincaglia plans to display in the lobby Bookstaver’s NJ Transit ID and the resignation letter Bookie sent him — typed on a typewriter. A train dispatcher is the rail version of an air traffic controller, monitoring activity on tracks and communicating with crews. Bookstaver was assistant chief dispatcher, a supervisory role. Sincaglia chuckled as he remembered Bookstaver’s stories — which often started with a rail accident or tragedy, but ended with a tale of how the employees came together. In many ways, the story of the Bookstaver family is the story of railroading in America. The son of a rail man, Bookstaver’s career started in an era of steam engines — powered by firemen who would shovel coal — and ended in an era of dual-powered locomotives that operate on diesel fuel or electricity. It started in an era of frequent train crashes and ended in an era of automatic signals and controls to ensure safety. Bookstaver survived rheumatic fever at age 7, a heart attack at 73, and numerous close calls on the trains. He’s earned the right to tell those stories. Like the one about beginning a ride on a steam train wearing a white shirt and coming back home with a blackened one. Or the train breakdown in the New York tunnel that required moving 800 people in 100-degree temperatures up a circular staircase into the Weehawken parking lot. Though his career spanned 64 years, his time on the trains goes back even further. Bookstaver, who grew up in Rutherford, started as a clerk in the passenger office at age 15. In 1948, he began working in the towers, then became a dispatcher about two years later. He was a chief dispatcher in Youngstown, Ohio, in 1968, then an assistant trainmaster, before returning to New Jersey in 1975. Bookstaver was recovering from a heart attack when terrorists struck on Sept. 11, 2001, one of three defining moments in the first 30 years of NJ Transit’s rail division. But he was working during the other two: A 1996 collision between two trains that killed both engineers and a passenger at the border of Secaucus and Jersey City, and last year’s Hurricane Sandy. The National Transportation Safety Board determined the engineer failed to see the red signal because of an eye disease. That Feb. 6, 1996, crash led, in part, to the building of the rail operations center in Kearny, the central nervous system of the railroad, where traffic managers control train signals and switches and study screens that monitor every NJ Transit train in the state. Bookstaver was at the center when Sandy struck. His white Mercury Grand Marquis was among 30 employees’ cars ruined by the storm. It was day twenty-five of my fifty-six day trip bicycling from New Jersey out to Wyoming on July 7, 1983 as I prepared to board the Chessie car ferry S.S. City of Midland 41 on that Thursday morning in Ludington (MI) to cross Lake Michigan. 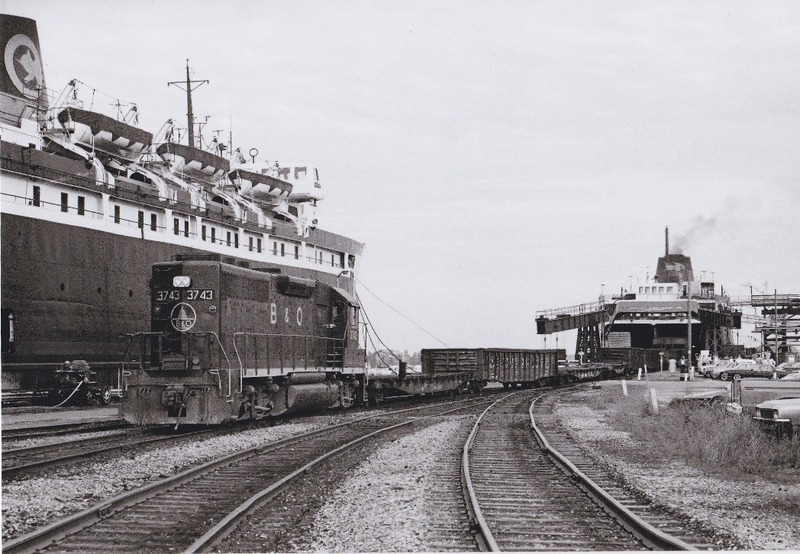 Before that would become a reality, twenty-three railroad freight cars needed to be off-loaded before departing passengers and their vehicles could be loaded on for the trip to Manitowoc (WI). Having never been witness to such an operation, it was fascinating to see the way these freight cars where offloaded efficiently and methodically, first from one side of the ship and then the opposite side until all twenty-three cars were off. B&O 3743 had the honors of this task. Fast forward thirty years later to June 30, 2013 when my wife and I were scheduled to cross Lake Michigan on our annual road trip. 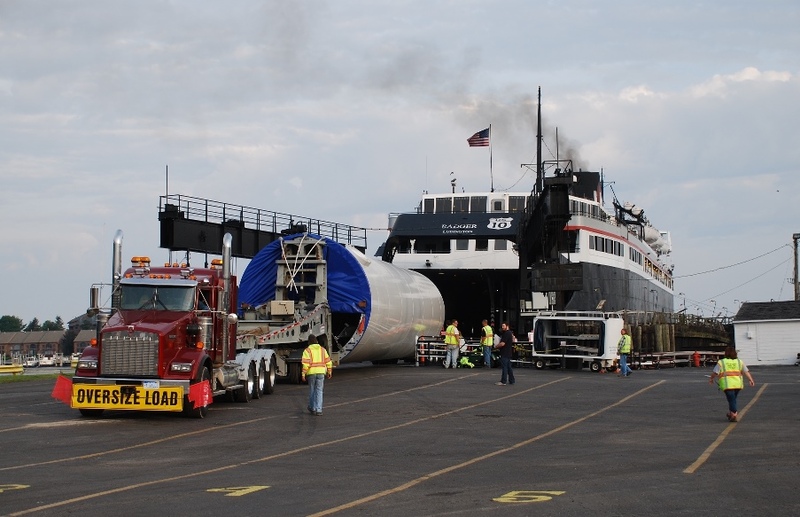 Passenger boarding was delayed by an estimated forty-five minutes as two huge wind turbine columns were off loaded from the S.S. Badger. From what I learned, they were destined to be transported across Michigan to the DTE Thumb Wind Farm located near the town of Battle Axe. Watching these truck drivers maneuver their over sized loads off this ship and the teamwork involved between driver and the ground crew guiding him with hand signals was fascinating. The most common designs for these steel towers is a cylinder about ten feet in diameter and anywhere from 150 to 200 feet long. After the second over sized load was off and boarding started, I commented to my wife how I would "...never complain about how hard it is to parallel park our little Kia!" 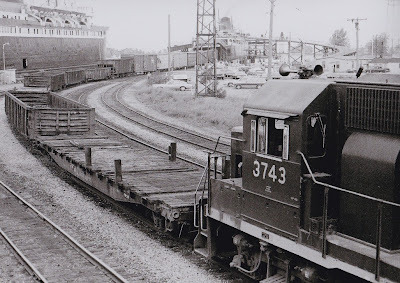 What has happened to B&O 3743 and S.S. City of Midland 41 over the past thirty years? First up is B&O 3743. 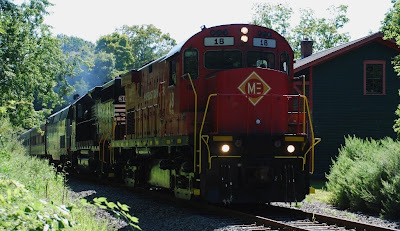 It was built in December, 1970 as a GP40 and later would be renumbered and repainted as CSXT 6519. It would later be rebuilt as a GP40M-3 and renumbered as Texas Mexican 1175. First Union Leasing Corporation would repaint it into a grayish color and retain its 1175 road number. Last report had FURX selling it to Herzog where they renumbered it as 206. The S.S. City of Midland 41 has also had a long history that dates back to March, 1940 when its keel was laid. It was built by the Pere Marquette RR at a cost of $2,000,000. She was considered to be the finest car ferry that was ever built. Statistics about this ship's capacity showed it was capable of carrying thirty-four freight cars, fifty automobiles and 376 passengers. In 1988 a routine Coast Guard inspection revealed her boiler mounts to be in bad condition and in dire need of major repairs. The S.S. City of Midland 41 would be forced into retirement. On September 23, 1997, Lake Michigan Carferry announced plans to renovate ship, but not as a carferry. It was to be towed by the tugs "Mary Page Hannah" and "Bonnie G. Selvick" to Muskegon (MI) where plans called for its superstructure and most of its hull cut down to her cardeck in order to be converted to a barge hauling heavy cargo. In June, 1998, the City of Midland began its new career as the PM41, nearly 10 years after she ended carferry service. JACKSONVILLE, Fla. - August 7, 2013 - CSX Corporation announced today the purchase of the Eastern Associated Terminal in Tampa, Fla. from the Ingram Barge Company. The phosphate export facility is adjacent to CSX Transportation Inc.'s Rockport terminal on Tampa Bay, and the combined entity will be called Rockport Terminals. As a result of the acquisition, CSX added 12 new positions for terminal operations to Rockport's current staff of 25. Shantel Johnson-Davis, who has led CSX's phosphates sales and marketing efforts in Tampa, was appointed assistant vice president and general manager - phosphates and fertilizers, and will lead both commercial activities and operations at Rockport Terminals. "Purchasing the Eastern terminal provides strategic long-term value for CSX," said Johnson-Davis. "We will leverage synergies of the two terminals to better serve our customers and grow this important business." Rockport Terminals are deep-water port facilities on Tampa Bay used for exporting phosphate from Central Florida's Bone Valley mining region. These facilities are located on more than 300 acres with over 25 miles of track, warehousing and state of the art loading systems. The footprint of the combined terminals allows for quick, scalable expansion, and capacity for 1 million additional export tons. Johnson-Davis said that Rockport Terminals will seek additional commodity export opportunities and add import bulk business over time. Approximately 300 CSX employees work in the Tampa Bay area, including train crews, engineering employees and mechanical teams. Facilities include a major classification yard and shops, an automobile distribution center and a TRANSFLO transloading terminal. JACKSONVILLE, Fla. - July 31, 2013 - CSX Corporation announced today that the Tuscola Industrial Rail Park in Tuscola, IL, has been designated a CSX Select Site. Select Sites are locations for manufacturing projects along the CSX network that can progress rapidly because standard land use issues have been addressed, and the site is ready for development following a comprehensive due diligence process. "We are excited to add this property to the Select Site program. The community of Tuscola has been great to work with to move the certification program along quickly. This site is competitive and delivers on our program objectives to provide industrial companies with easier development decisions, reduced risk and faster speed to market," said Clark Robertson, assistant vice president, regional development, CSX. "Located in a pro-business community, Tuscola Industrial Rail Park offers industry one of the few location options in the country at the convergence of railroad, interstate, and natural gas corridors," said Jonathan Gemmen, senior location consultant, The Austin Company. permitting, rail serviceability, proximity to highways or interstates, and other attributes. Once certified, the sites are also featured on a new user-friendly web portal featuring press releases, promotional materials and direct marketing to site selection professionals. In addition to the Tuscola Industrial Rail Park, CSX has designated 10 other sites located across CSX's 23-state service territory. CSX Corporation, based in Jacksonville, Fla., is one of the nation's leading transportation companies, providing rail, intermodal and rail-to-truck transload services. CSX's network spans approximately 21,000 miles, with service to 23 eastern states, the District of Columbia and two Canadian provinces. CSX's network connects more than 240 short line railroads and more than 70 ocean, river, and lake ports. More information about CSX Corporation and its subsidiaries is available at www.csx.com. Like us on Facebook (http://www.facebook.com/OfficialCSX) and follow us on Twitter (http://twitter.com/CSX). The Tuscola Industrial Rail Park is a 595-acre industrial park just west of Tuscola, Illinois, in Douglas County, approximately three miles west of Interstate 57. CSX's mainline rail corridor runs through the industrial park, offering two large rail-served industrial sites that are ready for industry. Multiple natural gas transmission lines intersect nearby, making this an optimal site for operations with large natural gas requirements. NORFOLK, VA. – Mark Manion, executive vice president and chief operating officer for Norfolk Southern Corporation, will address the Jefferies Global Industrials Conference in New York City at 1:30 p.m. EDT on Tuesday, Aug. 13, 2013. Interested investors can listen via simultaneous webcast at http://wsw.com/webcast/jeff78/nsc/. The presentation will be posted at www.nscorp.com.